A controversial telescope project on the top of the Mauna Kea mountain in Hawaii has sparked peaceful protests on and off social media across the United States. Opponents of the telescope, including celebrities, say the structure desecrates sacred land. They also say the land in question is designated as a conservation area. Supporters of the project point out that there are already 13 telescopes built within that conservation zone. But none are as large as the latest planned structure, dubbed the Thirty-Meter Telescope, which would require the destruction of five acres of land. 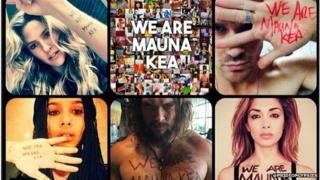 The Honolulu-born Game of Thrones star Jason Momoa posted pictures on Instagram and Twitter using the hashtag #WeAreMaunaKea, That and the hashtag #ProtectMaunaKea have seen big jumps in use this week. San Francisco Giants' pitcher Madison Bumgarner, Pussycat Doll Nicole Scherzinger and Momoa's on-screen spouse, Emilia Clarke, and real-life partner, Lisa Bonet, also got involved. Momoa's Instagram account is currently dedicated to the issue with a link to an online petition pasted as his status. The Instagram account @ProtectMaunakea also hosts pictures of hundreds of people who have posted signs in support of the conservation efforts. Organisers protested off social media as well by holding a worldwide sign waving with participants from Hawaii, Alaska, New York City, Las Vegas, Kentucky, Arizona, Tahiti and Tonga. Protestors have been camped out on the top of the mountain creating a human blockades for two weeks. At the beginning of the month local news outlets reported that over 30 people had been arrested. An online petition to halt construction and stop arresting protestors has over 30,000 signatures. "Our ancestors believed that there were numerous gods and goddesses and Mauna Kea was their temple. They feel strongly that his will disrupt their temple," says protestor Isa Center. "In Hawaii the land is precious to our people. It's a very strong cultural protest." The 18-storey, $1.4 bn (£957m) Thirty-Meter Telescope (TMT) project was proposed by the University of Hawaii and is projected to be operational by 2024. Funding for the project has reportedly come from the US, Canada, Japan, India and China. The telescope would let scientists see 13 billion light-years away. Astrophysicists behind the project, like Hawaiian Paul Coleman, say science and the sacred don't have to oppose one another. "The one thing that makes you Hawaiian is one of your ancestors came here in a canoe led by an astronomer," he told HawaiiNewsNow. This week the governor of Hawaii temporarily halted construction on the telescope, saying it was "a time out" and a chance for both sides to talk. Next story: Why is a Chinese takeaway box taking over election talk? You can follow BBC Trending on Twitter @BBCtrending, and find us on Facebook. You can even vote for us - we've been nominated for a Webby Award.